Senate Bill S2156A prohibiting the use of chlorpyrifos in NYS. Our State Legislators are Seeking Your Opinion. To access and respond to the NYS Senate Bill A2477A & S2156A – “Prohibiting the use of chlorpyrifos in NYS” follow this link. Thoughts to consider: Invasive insects that have come into our diverse Northeastern ecology from Asia, including the Asian invasive brown marmorated stink bug, the Asian spotted lantern fly, the Asian spotted wing drosophila and most importantly in this conversation regarding the use Chlorpyrifos, the highly destructive black stem borer, Xylosandrus germanus (Blandford), Coleoptera: Scolytidae, originally from southeast Asia. Collectively these insects are causing severe economic losses in our agricultural production systems across many food commodities grown in NYS. The additional expense to pest management to control the invasive pests in agricultural systems are staggering. The additional late season use of pesticides to manage crops and reduce economic losses nearing harvest is unprecedented in New York State. Chlorpyrifos; Lorsban: In the tree fruit industry, the use of Chlorpyrifos contributes to the economically viable and effective management of the forest invasive insect, black stem borer (BSB), in the family of beetles known as Ambrosia Beetles. Only 2mm in length, it has become a key pest in ornamental tree and tree fruit nurseries and most importantly, established and growing young and maturing tree fruit plantings. Problem: Since 2014 New York State apple growers, including our Hudson Valley tree fruit industry, have lost thousands of their newly planted and young apple trees from this insect pest. The loss of this important tool, Chlorpyrifos, has become a looming concern for the tree fruit industry, especially for the up-coming season, who need this tool to reduce the extensive losses we have been experiencing from this beetle. This tool, unlike all of the other tools used for pest management on apple, penetrates and remains active in the bark layer of the tree to inhibit the black stem borer from burrowing into the trunk. 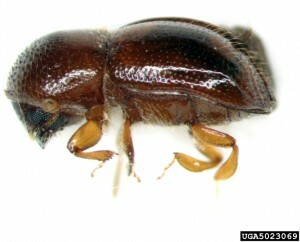 This occurs during long growing season as this pest has two generations. This beetle, if left unmanaged, will burrow to the center of the tree, creating a gallery for its young, carrying with it fungal spores to feed its brood. The tree then begins to wall off the wound, responding to the fungal presence and insect intrusion in order to defend itself. The process the trees experiences creates a ‘wall’ within the cambium layer is observed as cankers on the tree trunk. This suffocates the movement of sap, quickly killing the tree within the first year of this invasion. This scenario contributes to what has been coined Sudden Apple Decline (SAD), found throughout the Northeast, Michigan and mid-Atlantic state apple growing regions. Once the insect is within the wood of the tree there are no further methods of control left to the farmers to keep the insect from killing the tree. Agriculturalists have seen millions of dollars in apple orchard losses from this insect in costs associated with initial establishment of new plantings, subsequent removal and destroying these trees to reduce continued infestation, replanting followed by intensive IPM monitoring and implementation of intensive control measures. Present Use of Chlorpyrifos: Applying IPM tactics of monitoring the pest, and upon detecting the flight of the female beetle observing its activity in traps, provides growers with a prevention strategy through the use of a single prophylactic application of Chlorpyrifos during the pre-bloom period, which acts as an efficacious and critical tool to manage this pest. Timing and efficacy are the foundations for insect and disease pest management. This is especially true for this tool to manage this insect. The loss of this tool will likely have the greatest impact on smaller farms with greater edge to crop ration given black stem borer is an edge insect moving into tree fruit from the woodland edge. In New York State, apple growers use chlorpyrifos as a tree fruit insecticide, labeled and used before bloom to control the black stem borer. This application is well before fruit have even set on the tree. It is applied using shielded, directed application only to the trunk of trees to inhibit the insect from entering the trunk. Pesticide applicators have available to them personnel protective equipment (PPE), tractors with carbon filtered cabs and targeted course spray application equipment to keep applicators from direct contact with the active ingredient while reducing drift to off targets. Sound Proposal: A provision for the retention of Chlorpyrifos for pre-bloom use in apple is essential to controlling BSB until other equally or more effective methods other then Chlorpyrifos become available.